NORWALK—No matter how hard they tried to catch up, the Stratford Red Devils were just spinning their wheels. The reason could be summed up in two words: Saikwon Williams. The Brien McMahon senior forward scored 21 points and hauled down more than 15 rebounds, many of which came off the offensive glass, to lead the host Senators to a 75-55 win over the Red Devils in a non-league boys basketball game on Saturday. Stratford, which saw a three-game winning streak snapped, fell to 6-5 on the season. McMahon led 19-6 after the first quarter as McMahon’s Williams scored six points in the paint and Eric Miller (11 points) drained a pair of 3-point shots to spark the McMahon attack. The Red Devils kept clawing their way back into the contest, getting into a single digits three different times. The Senators, however, would always find an answer—mostly when Williams grabbing an offensive board and finishing the finish, or kicking it out for another McMahon 3-pointer. Stratford has been a team like that all season, but against the Senators defense the offensive flow wasn’t there. 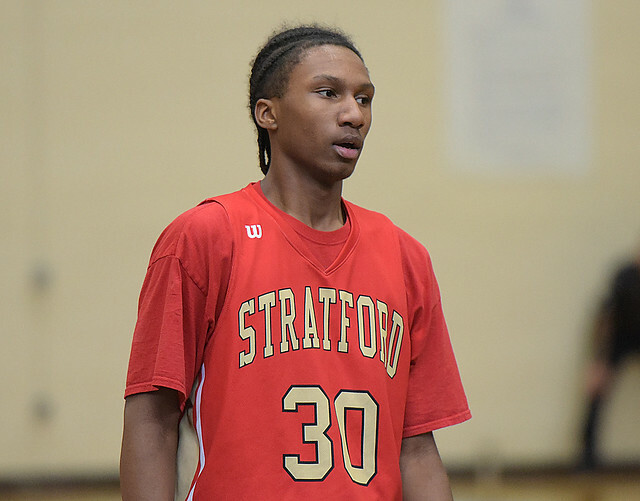 Jack Ryan led Stratford with 15 points while Jayquan Kirkland added 11 and Mike August had 9. The last time the Red Devils faced Williams, last season at Needham Gym, he was a few inches shorter and a few pounds heavier. Having worked on his game a lot over the past year, and growing to 6-3, Williams was a vastly different player than the one Stratford saw a year ago in an 84-65 win over the Senators. “Williams was a tough match-up for us,” Swaller admitted. The slow start doomed Stratford. Stratford took Sunday off, but was back on the court on Monday for practice in preparation for Tuesday’s home game against Bethel.